Luminar Users Guide | ZIRCAR Refractory Composites, Inc. Molds may be made from a wide variety of objects which are known as patterns. A pattern is the original object from which all replicas are made. Patterns may be made from plastic materials such as plasticine or clay, or they may be made of rigid materials like wood or plaster. There are many good books on pattern making and the type you choose to use with Mold Mix 6 & 7is a matter of personal preference. For a pattern to work well with Mold Mix 6 & 7, it must have no porosity. This means that patterns of wood or plaster must be sealed, preferably with shellac. Paints will work, but the film thickness of most paints will obscure fine surface detail. Unfired clay is the least successful of all pattern materials as it will leave a residue in the mold. Waxes are excellent for use with Mold Mix 6 & 7as pattern materials and require no special preparation. While anything may be modeled readily in waxes, the lost wax process is their highest usefulness. Mold Mix 6 will adhere quite firmly to surfaces that have not been treated with a parting agent. Several common parting agents have been show to work well. The first is PAM, a parting agent usually used in the kitchen. It must be applied sparingly as it will ruin the mold surface in heavy applications. Others are petroleum jelly in thin application gives good results as will a light coat of dish soap. Do not add water or let air get to the mix and keep the container sealed and airtight. Scoop out small amounts of mold material and put in Ziploc containers and Zip bags to minimize drying. Take a hand mixer and whip the mix until all lumps are broken down and the mix consistency mimics a thick cream. You will notice fibers in the mix. These fibers weave a blanket in the mold and add strength. The mix will solidify if it remains uncovered after mixing, but simply stir with a spoon, spatula, or mixer and the mix will regain its creamy consistency. Once again, keep all containers of Mold Mix 6 covered, even when actively applying. Take small container of pre-mixed Mold Mix 6 and paint on in thin layers with a soft supple brush. The finish on wax positive will determine finish on art piece. If the mold material wants to separate do not worry, just keep brushing. Start applying the mix at top and move down project. Place your pattern covered with the first coat in front of a cool fan to dry. This initial layer must be tacky dry before applying the next coat. Think of drying from inside-out. If you try to apply the mix too thick it will want to crack. Do not let the mix build up thick in undercuts of the mold. Try to paint each layer in a different direction to weave a blanket over wax and use the fibers in the mold material. Keep painting on layers until you are approximately 1/8 to 1/16th inch thick. Any thicker and it may not allow sharp areas to shrink and it may break off small details like arms or fingers. Let the mold dry totally-approximately 3 days. If it is still cool to touch wait an additional day. Small molds may take only 2 days to completely dry. Paint on thin layer of Murphy’s Oil use soft and let dry. Paint on the mix in thin layers and let dry. It will start to curl on the edges but this is OK. If you have no undercuts the mold should be easily removed and you can start using your mold. Microcrystaline wax is toxic when heated to burning. Burn out the mold with Tiger Torch wear respirator and take all necessary precautions including fire gloves, eye protection, etc. Burn outside on a day without wind. Get a metal garbage can and have the lid ready to put out any fire if the wax ignites. Fill the garbage can ½ way with water and place a steel rack on top. Then place your mold on top of the steel rack. Light the torch and put the torch on low. Point the torch to the bottom edge of mold, waving the flame from the bottom to the top. Keep the torch horizontal at all times. Do not point the torch directly into the can. Let it begin to drip slowly but continue to be cautious of the wax catching on fire. If the wax ignites, stop torching and let the fire drip into the water until it stops burning. Do not rush and do not worry if mold catches fire because it will. If wax leaches through mold material it will burn off during firing. At this point in the process the mold is very fragile, therefore be extremely cautious. Take the mold and gently put in a kiln and heat up to 1400℉ to return the mold to white. This material is resistant to thermal shock so heat the mold to this temperature as quickly as the kiln will allow. The recommended release agent for use with Mold Mix 6 is Bullseye Shelf Primer. It provides a wonderful release that will give you a soft stain finish to the glass wherever it touches the mold. Get a sifter and two. Make sure the mold is clean and sanded to a smooth finish. Vacuum the mold carefully and wear a respirator. Get a partner to help, and a large bucket ready to pour shelf primer. Mix 1 part of powder to 5 parts of. Mix well, then sift 5 times getting rid of chunks and foreign particles. Quickly after the last sifting (do not let the shelf primer settle) hold the mold upside down, pour in the mix, and then poor the mix out quickly and evenly. Do not let it settle in the mold and aim to achieve the thinnest coat possible. Speed during this procedure is extremely important if you have any bas relief or fine detail in your mold. Once this has been achieved put the mold back into the kiln and heat to 400℉ to burn off all the excess. You are now ready to use the mold. Select a container that completely surrounds the mold. Our containment walls of choice are stainless steels tubes and or pots. We have found that steel tubs tend to break down at high temperatures and pits into the mold. Do not load sand without respiratory protection. Use dry 80-grit clean silica sand or olivine sand to fill the space between the containment wall and the mold. We burn out our sand before first use to eliminate any foreign material. Gently cover top of mold to ensure that no sand gets into the mold. Pour sand carefully and slowly into the container. Try to match the container with the shape of the mold so that the sand walls are consistent. I believe this is your decision as each project comes with it’s own technical difficulties. You must think ahead while designing your. Will the glass flow into every space? Do I lay the pieces sideways, straight up or down? If I use a ceramic drip pot, I will surely capture bubbles as the glass drips down? Do I gently pour frit into my mold? Will I hit fragile points? All of these questions must be addressed before beginning the design. Take 10 hours up to 1010. 2 hours up to melting. Hold no more than 2 ¼ hours. Open face only 1 ½ (crystal flows faster than Bullseye. Frit must be ½ longer). If intricate, narrow spaces-hold 2 ½ hours to 3. Then continue rest of the program. Make sure the powder is in a container that can be properly sealed before mixing. Slowly add 4.8 lbs. (2.16 liter) of water to the one-gallon bucket, slowly incorporating the liquid with the powder. At this point the mixture will be very lumpy and contain pockets of unwetted powder. Next, take an emersion blender or a hand mixer and whip the mix until all lumps are broken down and the mix consistency mimics a thick cream. You will notice fibers in the mix. These fibers weave a blanket in the mold and add strength. The mixture should be left to set for 30 minutes before application. The mix will solidify if it remains uncovered for an extended period of time, but simply stir with a spoon, spatula, or mixer and the mix will regain its creamy consistency. Once again, keep all containers of Mold Mix 7 covered, even when actively applying. Take small container of pre-mixed Mold Mix 7 and paint on thin layers with a soft supple brush. The finish on wax positive will determine finish on art piece. If the mold material wants to separate do not worry, just keep brushing. Start applying the mix at top and move down project. Place your pattern covered with the first coat in front of a cool fan to dry. This initial layer must be tacky dry before applying the next coat. Think of drying from inside-out. If you try to apply the mix too thick it will want to crack. Do not let the mix build up thick in undercuts of the mold. Try to paint each layer in a different direction to weave a blanket over wax and use the fibers in the mold material. Keep painting on layers until you are approximately 1/8 to 1/16th inch thick. Any thicker and it may not allow sharp areas to shrink and it may break off small details like arms or fingers. Let the mold dry totally-approximately 3 days. If it is still cool to touch wait an additional day. Small molds may take only 2 days to completely dry. Microcrystaline wax is toxic when heated to burning. Burn out the mold with propane torch while wearing a respirator and take all necessary precautions including fire gloves, eye protection, etc. Burn outside on a day without wind. Get a metal garbage can and have the lid ready to put out any fire if the wax ignites. Fill the garbage can ½ way with water and place a steel rack on top. Then place your mold on top of the steel rack. Light the torch and put the torch on low. Point the torch to the bottom edge of mold, waving the flame from the bottom to the top. Keep the torch horizontal at all times. Do not point the torch directly into the can. Let it begin to drip slowly but continue to be cautious of the wax catching on fire. If the wax ignites, stop torching and let the fire drip into the water until it stops burning. Do not rush and do not worry if mold catches fire because it will. If wax leaches through mold material it will burn off during firing. At this point in the process the mold is very fragile, therefore be extremely cautious. Take the mold and gently put in a kiln and heat up to 1400℉ to return the mold to white. This material is resistant to thermal shock so heat the mold to this temperature as quickly as the kiln will allow. Although no release agent is not a necessity, the recommended release agent for use with Mold Mix 6 is Bullseye Shelf Primer. It provides a wonderful release that will give you a soft stain finish to the glass wherever it touches the mold. Get a sifter and two. Make sure the mold is clean and sanded to a smooth finish. Vacuum the mold carefully and wear a respirator. Get a partner to help, and a large bucket ready to pour shelf primer. Mix 1 part of powder to 5 parts of. Mix well, then sift 5 times getting rid of chunks and foreign particles. Quickly after the last sifting (do not let the shelf primer settle) hold the mold upside down, pour in the mix, and then poor the mix out quickly and evenly. Do not let it settle in the mold and aim to achieve the thinnest coat possible. Speed during this procedure is extremely important if you have any bas relief or fine detail in your mold. Once this has been achieved put the mold back into the kiln and heat to 400℉ to burn off all the excess. You are now ready to use the mold. This step is your decision as each project comes with its own technical difficulties. You must think ahead while designing your piece. Will the glass flow into every space? Do I lay the pieces sideways, straight up or down? If I use a ceramic drip pot, I will surely capture bubbles as the glass drips down? Do I gently pour frit into my mold? Will I hit fragile points? All of these questions must be addressed before beginning the design. 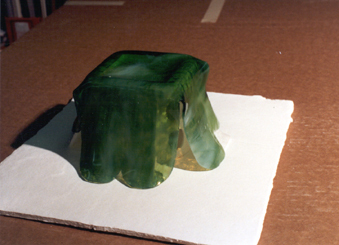 After Firing, the mold must be removed from the cast glass. If the mold is firmly adhered to the glass soak the mold in water to soften the mold. The small bits of mold mix that remain can be removed using a soft bristle brush, like a tooth brush, and water. Refractory Sheet Type DD (RS-DD), formerly known as Luminar Moldable Sheet Type LMS, is an advanced material for glass slumping and fusing. No other mold material is as strong, light, versatile, durable, and easy to use. RS-DD has the ability to become pliable while wetted with water and regain its original strength when dried. Thus when it is given a shape when wet; it will retain that form when dry. RS-DD comes as a semi-rigid sheet and is available in four thicknesses: 20, 40, 90 and 120 thousandths of an inch. RS-DD 20 has the least strength and highest moldability. RS-DD 120 has the highest strength and least moldabilty. On firing, a small amount of organic binder burns out and ceramic strength is developed. A fired RS-DD mold will have about 3 times the strength of unfired RS-DD. Once fired RS-DD losses its ability to be molded when wet. RS-DD is immune to thermal shock and, since it is very light, RS-DD has been proven to allow firing rates of 130° F/min in a stationary studio kiln with 1/8″ glass. This manual will describe methods of preparing and using RS-DD molds. Selection of the best thickness of RS-DD to use is mostly a matter of balancing the strength of a given thickness of RS-DD to the degree of curvature to be developed in the final piece. 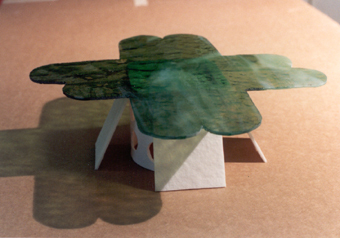 When attempting to take a plane surface such as a sheet of RS-DD and form it to a curved surface, such as a deeply bent lamp element, you will observe that a certain amount of “puck- ering” or folding will result. This is because the curved surface has apparently less surface area than the plane surface area started with. This effect is more pronounced when using thicker RS-DD because the difference in the radius between the inner and outer surfaces of the RS-DD is greater. Using the thinnest necessary thickness of RS-DD will minimize any difficulty. In the event that folds are unavoidable, excess material may be cut away much as a seam- stress would cut a “dart”. Methods of cutting RS-DD are given below. When wetted the RS- DD may be firmly squeezed and held together at the seam to result in a firm bond on drying. The seam can be dressed by burnishing with a damp cellulose sponge. If necessary, irregular- ity may be corrected using ZIRCAR Mold Mix 6 to build up and smooth the seam. RS-DD may be cut with a utility or exacto knife either wet or dry; although cutting is generally easier when the material is wet. After the desired shape is cut, the RS-DD is ready to immerse in water. Use a shallow tray and warm water. The piece should be fully submerged. The table below gives soak times for the different thickness of RS-DD. Test for flexibility. The moistened sheet should feel like wet leather. If sheet is not flexible enough, apply more water. If sheet is overly moist, blot up excess water with a paper towel. Any unused wet sheet can be dried and stored flat for re-use. RS-DD will bond quite firmly to most any surface even glass. To assure easy removal from the pattern, a very thin coat of “Vaseline” should be applied. Once the RS-DD is laid on the pat- tern, it must be held firmly against it in order to accurately replicate its contours. Clothespins around the edges generally work well to hold the RS-DD in place. RS-DD may be left alone to air dry, although it is often desirable to accelerate drying. This is easily done by warming to 200°F in the kiln. Take care that the pattern you use will able to withstand heating. Once dried, the RS-DD regains its original rigidity. 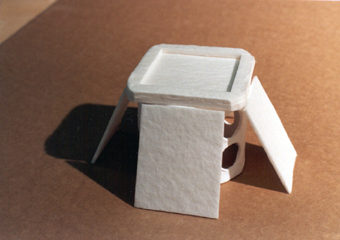 Prior to firing, it is often desirable to finish the surface of the RS-DD mold. This is easily done using a damp cellulose sponge or finger. The RS-DD surface maybe burnished with either of these until it shines. If the mold is to be used for fusing, give it a coat of ZIRCAR Alumina Rigidizer/Hardener to avoid sticking. This step must be repeated each time the mold is fired for fusing. No special precautions are necessary to fire an RS-DD mold. As mentioned, the firing can proceed at very rapid rates with no difficulty. However, in the event that the glass is fairly heavy, it will be desirable to pre-fire the mold. This will develop its ceramic strength before it is loaded with glass, thus reducing the possibility of firing some defor- mity as a result of the weight. Once an RS-DD mold is fired, it can be wetted and shaped again. RS-DD may be used as a fusing, surface for most glass commonly used with the excep- tion of “Wasser Glass” which has a pronounced tendency to adhere to RS-DD. It is critical that the surface of RS-DD be treated with a coat of ZIRCAR Alumina Rigidizer/Hardener each time the RS-DD shelf is fired if adhesion is to be avoided. Application with a nylon brush is best. Should the surface require dressing after applica- tion of the rigidizer, a damp sponge may be used to gently smooth the surface. Fire the RS-DD to fusing temperature no faster than 15° F/min. on a flat ceramic kiln shelf prior to use for fusing. The slow firing will avoid warpage and develop the ceramic strength of the RS-DD. It is best to fashion a shelf support of RS-DD for the RS-DD shelf to retain the advantages of RS-DD’s low mass.